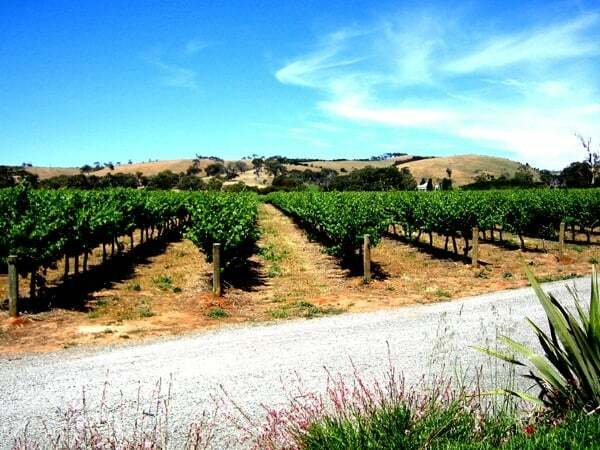 McLaren Vale is a wine region approximately 35 km south of Adelaide in South Australia. It is internationally renowned for the wines produced in the region, which was named after either David McLaren, the Colonial Manager of the South Australia Company or John McLaren who surveyed the area in 1839. Among the first settlers to the region in late 1839, were two English farmers from Devon, William Colton and Charles Thomas Hewett. William Colton established the Daringa Farm and Charles Thomas Hewett established Oxenberry Farm. Both men would be prominent in the early days of McLaren Vale. Although initially the region’s main economic activity was the growing of cereal crops, John Reynell and Thomas Hardy planted grape vines in 1838 and the present-day Seaview and Hardy wineries were in operation as early as 1850. Grapes were first planted in the region in 1838 and some vines more than 100 years old are still producing. Today there are more than 88 cellar doors in McLaren Vale. The majority are small family-run operations and boutique wineries. McLaren Vale is an industry leader in water conservation and re-use and there are three main sources of water in McLaren Vale which are important to irrigated grape production. Traditionally the main sources have been groundwater aquifers in the Willunga Basin and surface catchment dams, where water is collected and stored from natural run-off. Sprinkler or flood irrigation has not been used in McLaren Vale for over 25 years. Our local distributor for Heritage Water Tanks in McClaren Vale, employs a network of installers throughout the state that will ensure that your domestic, commercial water tank or fire tank is installed with professionalism. We operate throughout SA including Aberfoyle Park, Aldinga, Aldinga Beach, Blewitt Springs, Chandlers Hill, Cherry Gardens, Christie Downs, Christies Beach, Clarendon, Coromandel, East Coromandel Valley, Darlington, Dorset Vale, Flagstaff Hill, Hackham, Hackham West, Happy Valley, Huntfield Heights, Ironbank, Kangarilla, Lonsdale, McLaren Flat, McLaren Vale, Maslin Beach, Moana, Morphett Vale, Noarlunga Centre, Noarlunga Downs, O’Halloran Hill, O’Sullivan Beach, Old Noarlunga, Old Reynella, Onkaparinga Hills, Port Noarlunga, Port Noarlunga South, Port Willunga, Reynella, Reynella East, Seaford, Seaford Heights, Seaford Meadows, Seaford Rise, Sellicks Beach, Sellicks Hill, Tatachilla, The Range, Whites Valley, Willunga, Willunga South, Woodcroft and surrounding areas.